Prior to the 1860s, the western two-thirds of San Francisco, the 'Outside Lands', was only sand dunes and coastal scrub. The undesirable land had no level ground and was covered in ever-shifting dunes, some more than 100 feet tall. However the growing city needed land, so local developers began to employ huge steam shovels to level the sand hills and fill in the extensive tidal marshes. By 1864 the area had it's first toll road, Geary Blvd, extending from the city, seven miles west, to the ocean. At first the area attracted only businesses that required lots of cheap land like race tracks, cemeteries, dairy farms, and orphanages. But eventually the road prompted many downtown residents to move out and settle along the road. Within a few years there were 3,000 residents and local boosters, hoping to attract more homeowners, renamed one area 'The Sunset' and another 'The Richmond' due to its perceived similarity to Richmond, Australia. 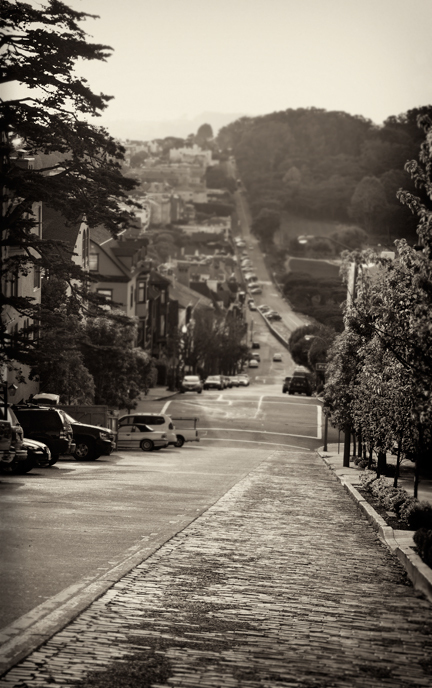 Soon prestigious neighborhoods were also being developed, such as Presidio Terrace, Lake Street, Sea Cliff, and Presidio Heights (photo above). By the turn of the century the reclaimed area, highlighted by the lush, expansive Golden Gate Park, had been transformed from barren sand dunes into a series of residential neighborhoods with trees, lawns, parks, and landscaped hills. The former Outside Lands were no longer recognizable as the Great Sand Waste.